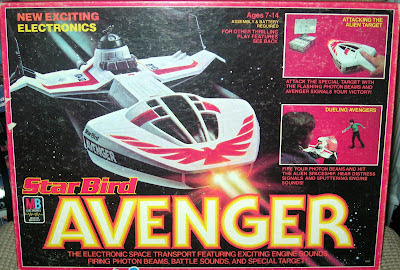 The spaceship you are gazing at is the Milton Bradley Star Bird, or in this case, the second incarnation of the cruiser, the Star Bird Avenger. 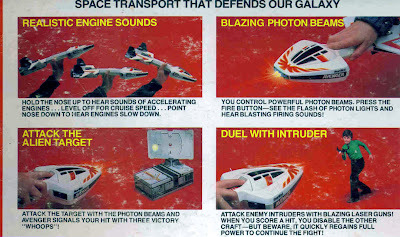 Featuring "new exciting electronics," this nicely-designed "space transport" features "exciting engine sounds, firing photon beams, battle sounds, and special target!" The Star Bird (sans the specification "Avenger") was first released by Milton Bradley in 1978, shortly after Star Wars took the world by storm, and my next door neighbor and best friend from West Milford, David, was the first kid in Glen Ridge (and particularly on Clinton Road...) to have one. The ship was truly state-of-the-art for the time, because if you owned two Star Birds they could electronically duel with one other. Or as the box put it: "Fire your photon beams and hit the alien spaceship. Hear distress signals and sputtering engine sounds!" In other words, the Star Birds were relatively interactive, at least for the disco decade. 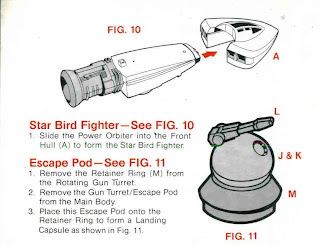 In the event you didn't have two ships, the Star Bird also was sold with an "alien target." The box noted: "Attack the special target with the flashing photon beams and Avenger signals your victory!" The other interesting aspect of the Star Bird was that it was actually several starships housed as one. For instance, mounted on the dorsal rear of the ship was an "escape pod" and cannon, in case of battle damage. Per the box: "Rotating gun turret - rear gun turret doubles as an escape pod. Just release the retainer and go whirling through space." Also, perched on each magnificent wing of the large star bird stood a small one-man "interceptor" fighter" that could be removed for snub-nosed combat. 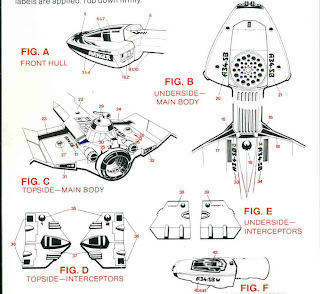 On the Star Bird, the interceptors were molded in gray. On the re-vamped, Avenger, they were jet black. The box described the interceptors like this: "Detachable Interceptors. Interceptors fit onto the wing tips. Deploy them for battle action." An added bonus: the cockpit housing could be removed in this mode too and you'd get a third fighter, the so-called "power orbiter." "For the fastest craft in the galaxy," read the description, "release the orbiter from the front hull. Even this stream-lined orbiter controls full power over photon beams and engines." The primary difference between the Star Bird and the upgraded "Avenger" is the decals that came with the ship. Avenger could be emblazoned with a giant bird of prey on its cockpit section, which was very cool. It was also labeled "Avenger" on both sides of the forward section. Apparently, there was a third version of the ship as well, one called Star Bird Space Avenger. I never actually saw that variant. I don't know if it is simply nostalgia, but I've always loved the design of the Star Bird. It isn't overly imitative of Star Wars, but rather a very sleek, very unique craft. The Intruder - though much-harder to find these days -- is not quite in the same league, since it is really a variant of the Star Bird design. Even my ten year old mind wondered how the "menacing alien" from another "galaxy" had managed to design a ship nearly identical to the heroic Avenger. 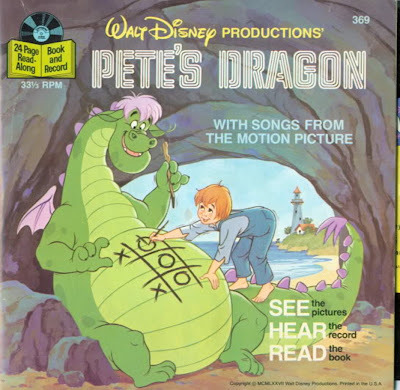 But perhaps that only added to the imagination and make-believe. I remember "pretending" to be commander of the Star Bird, and going on a secret mission behind enemy lines to find out how the aliens behind the Intruder had stolen the superior design of my spacecraft. Isn't make-believe great? John the Star Bird is a sleek design. It looks like a aerodynamic version of the Y-Wing without the two nacelles. Thank you for the comment, my friend. Proud owner of both the Star Bird original variant and the Intruder. Still have them (and the boxes they came in!) and last time I checked, they still worked fine. These were terrific toys -- these ships had many adventures with my Eagle One and Millenium Falcon, when they weren't all lined up on my toy chest looking awesome together!